The greenhouse effect is a natural function of Earth’s atmosphere, the happy result of which is a livable world. Gases in the atmosphere, especially water vapor, insulate the Earth, preventing the sun’s heat from escaping. The Earth stays warm and life thrives. But human activity, especially the use of fossil fuels, has increased the amount of greenhouse gases in the atmosphere. More heat is absorbed, increasing the greenhouse effect and bringing negative consequences to Earth’s systems and life. Naturally occurring greenhouses are good for the Earth, but since the Industrial Revolution, and the burning of fossil fuels, greenhouses gases are on the rise. Too many greenhouses gases, and the sun's heat gets trapped in the atmosphere, warming the planet and the oceans. Global warming leads to severe weather extremes: droughts and floods, hot, hot summers and freezing winters. So while some greenhouses gases are good, too many in the atmosphere and it creates devastating effects worldwide. Greenhouse gases can occur through natural processes, such as volcanic eruption, or through human activity. Those generated through human behavior are problematic because they alter Earth’s natural systems. Problematic GHGs include methane, nitrous oxide and especially carbon dioxide. By burning fossil fuels such as coal, natural gas and petroleum, humans have contributed large amounts of CO2 to the atmosphere. The United States produces most of its energy from these fossil fuels. Other GHGs include water vapor, F-gases such as chlorofluorocarbons and hydrochlorofluorocarbons, and tropospheric ozone . Human contribution of greenhouse gases to the atmosphere has risen sharply since the EPA reports. The CO2 collects in the atmosphere, trapping more heat. The result is global warming. The phrase means that Earth’s average temperature is increasing. Since 1880, it has risen 1 1/2 degrees Fahrenheit, reports the Intergovernmental Panel on Climate Change. The temperature increase is melting ice stored at the Earth’s poles, which creates a change in sea level. It also creates climate change. Climate change means that the average weather on Earth is different than it used to be. Consequences of a changed climate can include freak weather, increased flooding, hotter heat waves, stronger hurricanes and more droughts. The changes in weather create still more results. For instance, more droughts create the dry conditions that fuel massive wildfires. Meanwhile, climate change affects Earth’s biodiversity, and biodiversity is needed for healthy ecosystems. Species are going extinct at a breakneck rate -- up to 1,000 times faster than normal, says the International Union for Conservation of Nature. 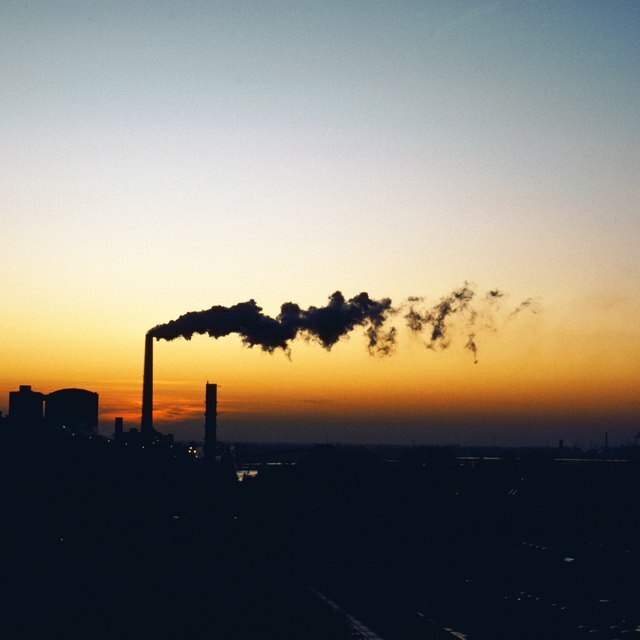 Human energy production releases chemicals such as nitrogen oxide that react with other chemicals when sunlight is present, creating ozone, another greenhouse gas. Ozone is harmful to ecosystems as well. It damages crops and creates respiratory problems in human beings. Chlorofluorocarbons and hydrochlorofluorocarbons are chemicals used in refrigerants -- for example in automobile air conditioners. CFCs destroy the natural atmospheric ozone layer, so industry began using HCFCs instead. HCFC, though, is a greenhouse gas. All the F-gases last a long time, so humans will be living with their effects on the climate for tens if not hundreds of years, the EPA warns. NASA: What Are Climate and Climate Change? University Corporation for Atmospheric Research: How Much Has the Global Temperature Risen in the Last 100 Years? Johnson, Sophie. "How Are Greenhouse Gases Bad for the Earth?" Sciencing, https://sciencing.com/greenhouse-gases-bad-earth-23688.html. 19 April 2018.